I think this is my favorite picture so far! 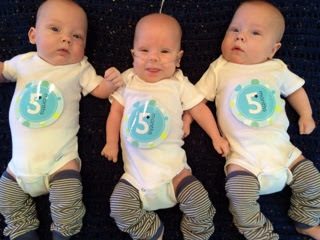 The boys turned 5 months old last Monday! (I know I’m a little late!) And they’re finally almost big enough for their legwarmers. (Not really but I can pretend). Yay! We took our pictures a few days late too. But not because we didn’t try. The first time I tried I got a few ok pics. Then Logan had a meltdown. I also learned that they aren’t quite big enough for chair pictures. 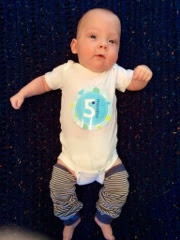 Anyways, I can’t believe it’s been 5 months already! We are loving every minute with our whole family at home! (Well not every minute but most minutes!) I don’t even mind all the poop and spit up. Brian might though because the boys seem to target him! Ha! That means they love me more right?! James has peed on me about every other day since he came home though! 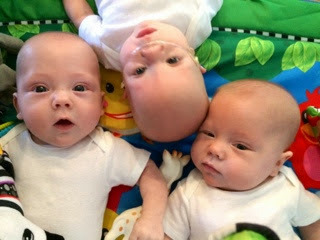 The boys are pretty good babies overall. Most importantly, they sleep well at night. Right now, we feed them at 9, then they sleep until around 3. When one wakes up we get all 3 up to eat. Brian and I both get up for MOTN feeding time. One of us feeds Mason and Logan and the other one feeds James. We’ve gotten pretty good at it and can usually get them changed, fed, and back to bed in 30-45 minutes. Then they sleep until 6-7! Last night no one woke up until 4 am so hopefully they’ll make it a few more hours soon! 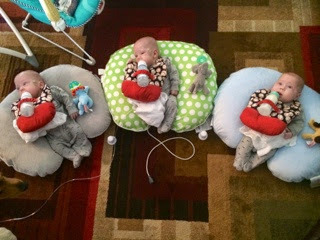 We take turns every night on who gets the monitor for paci duty! If I’m by myself I just sit in front of them and keep bottles in, burp, and keep everyone happy. But I usually hold James because he’s not a good eater (but he’s getting better!) 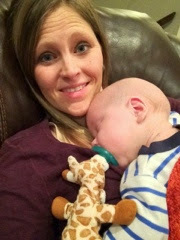 If you look closely, you’ll see that James is NOT eating his bottle in this picture! In a surprising turn of events, Mason is now our happiest baby. Mason loves to play. 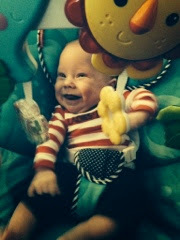 Mason especially loves the play gym! He’ll stay down there for an hour sometimes. And he’s a talker! 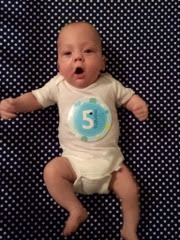 He babbles non stop! So cute! And he’s discovered his hands and loves to put them in his mouth. He is also pretty friendly and he’ll let anyone hold him. Mason usually has a meltdown between 7-9 pm. Then he’s angry. So he joins us for dinner quite often. Mason is also our best sleeper. He usually sleeps for the entire nap time. And he’s almost never the one who wakes up first in the middle of night. Yay Mason! 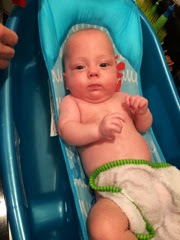 Mason also likes bath time. Look at those cheeks! Ha! 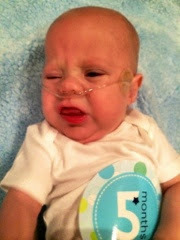 Mason does not like tummy time. He almost always rolls over right away! We’ll keep working on it though! He looks like he’s up to no good doesn’t he?! Logan is our sweet boy. He’s probably the most laid back of all 3 too. 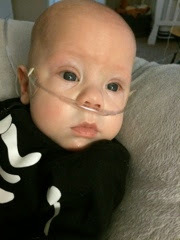 He is still on his oxygen all the time. We saw Dr. Peeples about a week and a half ago in the newborn clinic again and we did a swallow study. Logan is not aspirating which made me super happy because that means he can still breast feed and get breast milk bottles. But just to be safe, we’re thickening Logan’s formula bottles to a nectar consistency (think tomato juice consistency). We also started caffeine and an inhaler to help open up his lungs and hopefully help him take deeper breaths. He hates the inhaler and acts like I’m literally trying to kill him every time we do it (which is twice a day!) I hope it works! Logan also loves the play gym (not as much as Mason though!) 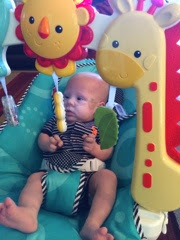 And Logan loves the bouncy seat! But Logan’s favorite thing in the whole world is his swing! Sometimes he’d rather swing than be held. So he swings. A lot! And he holds onto his Sophie the Giraffe while he swings. Logan has discovered his hands. He just stares at them. Ha! And he’s learned how to stick out his tongue and blow spit bubbles. So he’s usually a little drooly! Logan does not like bath time! Not at all! He usually screams the whole time! 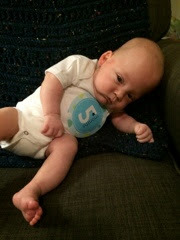 Logan also does not really appreciate tummy time. We usually do his tummy time with him laying on one of us. 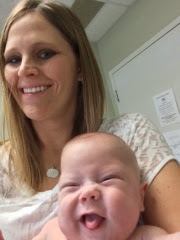 The funniest thing that Logan likes: pictures! He gets so happy whenever I start picture time! Ha! This is serious Logan. In his skeleton sleeper. James is loving living at home. Or I think he is! He’s just too sweet! He seems to be adjusting really well. He loves the play gym too. Almost as much as Mason! And he really loves the bouncy seat! 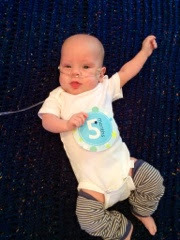 He doesn’t like it quite as much as he liked the mobile at the NICU but it’s close. James loves the bouncy seat! James doesn’t talk much but he does smile quite a bit. Usually when he’s playing by himself! 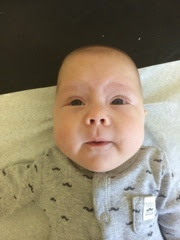 And he gave Dr. O’Neill, our pediatrician, a huge grin the other day at his first appointment! James is also a good sleeper at night time. Not as good at nap time! He does not like to be swaddled with his arms wrapped up. We wrap them up sometimes but he always gets at least one free. He sleeps ok that way though so I’m not too worried. James is probably the best about self soothing in his bed (not other places though). He loves to look at the stripes and letters on the wall. He usually lays in bed for a while then goes to sleep on his own. 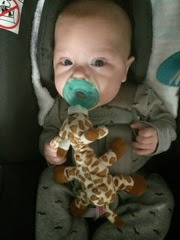 He has his giraffe wubbanub but he doesn’t always have to have it in his mouth. Sometimes he just likes to hold it! James is not a very good eater. I know you can’t tell foe the pictures! But he fights us several times a day so we have to really work with him and stay patient to try and get him to take as much as possible at each feeding. He’s doing much better the last few days. 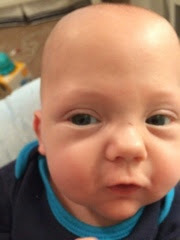 His reflux combined with the fact that he didn’t eat by mouth for so long just make eating harder for Mr. James! But he’ll get the hang of it! James also doesn’t like car rides or his carseat some days. 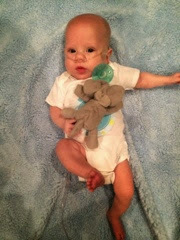 Last week I had to take him back to the hospital for an appointment and he cried almost the whole way there. Then he was happy for the doctor. And then he cried from the minute I put him back in his carseat until we almost made it home! I hope he gets over this soon! 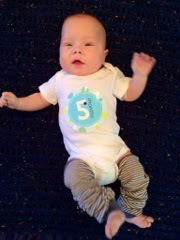 He’s going to be in the car and his car seat quite a bit! And a selfie of the best part of being a mommy. Baby snuggles! Thanks everyone who has helped us get this far! We seriously could not have made it without each and every one of you! 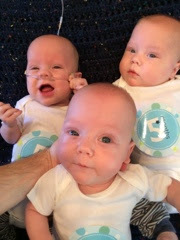 This entry was posted in Homecoming Day, NICU, Triplet Milestones by Angela Mann. Bookmark the permalink.